Suffolk County, NY -- September 24, 2018 -- Suffolk County Transportation, the transit agency serving Suffolk County, New York, announced it has launched a new mobile ticketing application for riders. 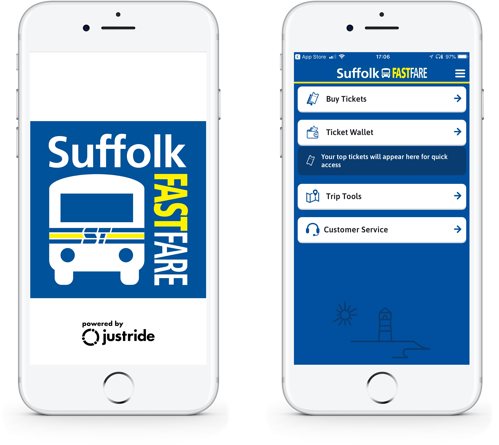 The app, Suffolk FastFare, is available for use on all Suffolk County Transit buses and offers an upgrade to current paper ticket options by allowing riders to purchase tickets on their smartphones anytime, anywhere and then display them on screen. Passengers using Suffolk FastFare can pay for tickets using a credit or debit card, or via digital payment services such as Masterpass and Apple Pay. There are a variety of ticket bundle options available including 2-ticket, 10-ticket and 20-ticket bundles. When passengers purchase the 20-ticket bundle, they also get one ride free included in their purchase. Tickets are then displayed on screen as a digital watermark, which are shown to the driver when boarding the bus. The app is also integrated with Transloc’s Rider app so riders can get quick access to real-time bus times and alerts. Suffolk FastFare is available for download from both the App Store and Google Play. Suffolk County Transportation is using the market leading Justride Platform from Masabi to power the new app. With over 40 clients across 4 continents the Justride Mobility Platform is the most widely deployed end-to-end mobile and account-based ticketing solution in operation, serving the largest agency in the USA to the smallest bus operator. As part of the deployment, Justride will be using Mastercard Payment Gateway Services to enable simple, safe and secure in-app digital payments. For more information about Masabi and its mobile ticketing solutions, please click here.